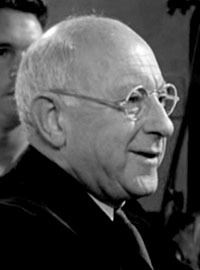 Director, producer, writer and actor, Cecil Blount DeMille formed an alliance with vaudeville musician, Jesse L. Lasky, and a glove salesman named Samuel Goldfish (later Goldwyn) called the Jesse L. Lasky Feature Play Company in 1913. In time he would be called "the founder of Hollywood", "the worlds greatest director" and "the showman of showmen". A prodigeous producer during the silent era, he continued to discover stars in the sound era such as Evelyn Keyes, Francesca Gaal, Paulette Goddard, Gary Cooper, and Charlton Heston. He later appeared in front of the camera, playing himself in Sunset Boulevard (Paramount, 1950). He produced and directed The Greatest Show On Earth (Paramount, 1952), winning an Academy Award for best picture. His remake of The Ten Commandments (Paramount, 1956), his last film, was as big a hit as his original, 1923 version.